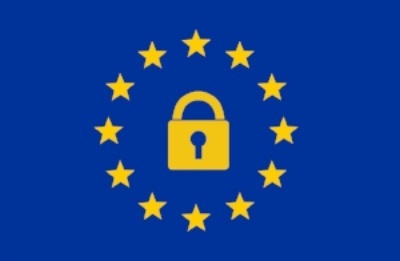 On May 25th, 2018 the General Data Protection Regulation (GDPR) went into effect to provide enhanced data privacy protection for European Economic Area (EEA) citizens. It applies not only to EU-based businesses but any business that controls or processes the data of EU citizens. This regulation is EU-only now, but nations around the world including the United States are likely to take notice and consider similar legislation. User visits the website (cookie tracking notification and consent capture). 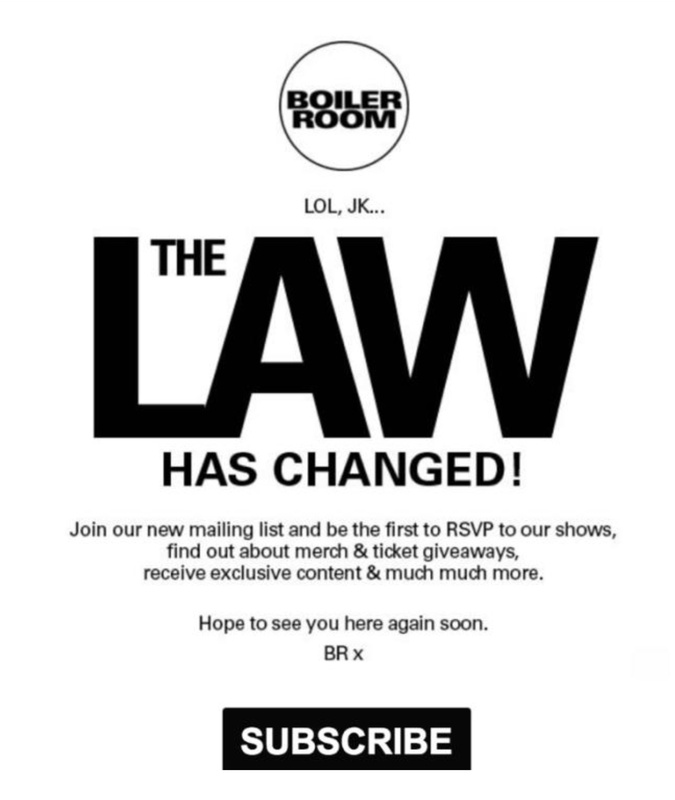 User submits a web form (legal basis for processing and communicating). Business want to send user an email (legal basis for processing and communicating). If your company website is only in English, you should present all users with notification, and the option to opt-in or opt-out of cookie tracking. Unfortunately, this means you may lose significant website visit data as most likely the majority of users will opt-out of cookie tracking, or, not opt-in. A key concept of the GDPR is that "not opting-out" is not considered "opting-in". If your company website is in multiple languages that reside on different URL subdirectories (ex: "themarketelement.com/de/...", you should present EAA visitors with an international version of the website with the cookie notification and the option to opt-in or opt-out of using them. There are six lawful bases of GDPR which can establish the right to process EEA citizen data and communicate with them. For marketing and lead nurturing through HubSpot, we recommend establishing lawful basis through legitimate interest, either with or without explicit consent. The first way to establish lawful basis for communication is through legitimate interest with explicit consent. 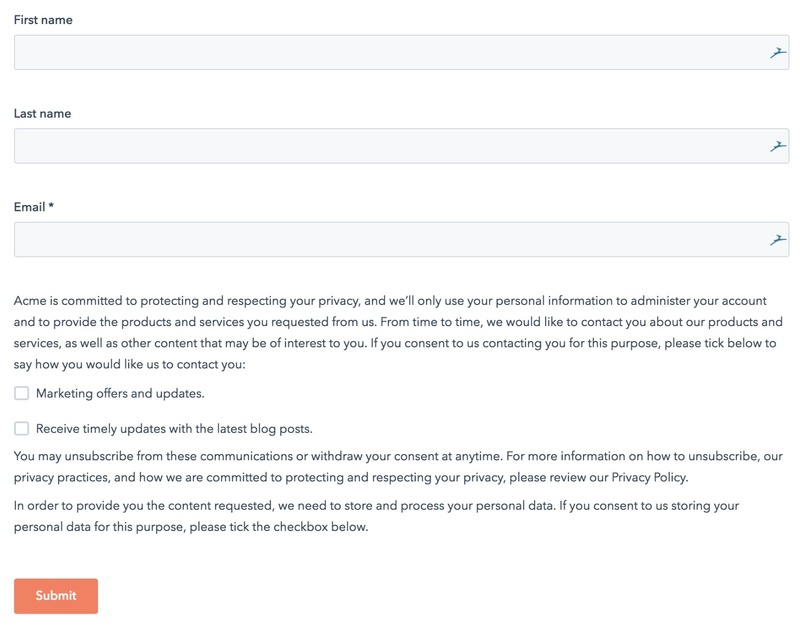 HubSpot’s new GDPR tools allow users to present options for site visitors to consent (explicitly opt-in) to receiving certain email types as part of the form. This method is termed “Consent checkbox for communications; form submit as consent to process”. Establish a basis to communicate explicitly through consent when visitors check the box. Establish a basis to process their data implicitly since they submitted the form. 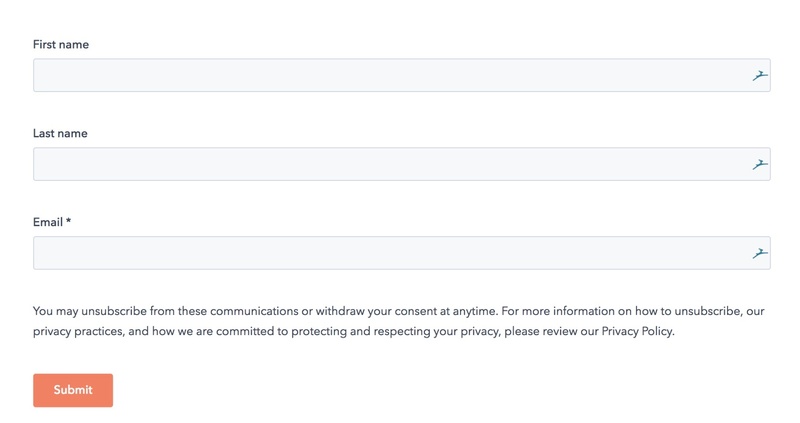 As you can see above, the text additions to the form are daunting, and you should expect form submission rates to drop because of this lengthly addition. However, this method is quite explicit and should stand firmly against legal scrutiny, reducing your risk of GDPR fines or penalties. The other recommended method for establishing a lawful basis to process data and communicate with users is legitimate interest without consent. Under this method, you implicitly establish a lawful basis for processing and communicating visitor data through “legitimate interest” when users are presented with data privacy information and still submit the web form. While the legitimate interest (without explicit consent) method is certainly more marketing and conversion rate friendly, it is more ambiguous. By not explicitly establishing a lawful basis for processing or communicating website visitor data, you risk serious fines from GDPR authorities. It's Your Decision: Which Method are You Most Comfortable with Pursuing? Choosing between explicit consent or just legitimate interest is key to ensure you're compliant with GDPR requirements. If you are unclear which method to pursue, we recommend you contact a data privacy expert of lawyer to determine which is the most appropriate for your business. Under the new GDPR regulations, a foundational action your organization should undertake is building HubSpot lists of both EEA and non-EEA contacts. For non-EEA contacts, nothing in your email communications needs to change right now. We recommend using workflows to assign the "N/A" value to their lawful basis property. In order to establish a lawful basis for communications with existing EEA contacts in HubSpot under the GDPR, your company should ask for their explicit consent via email. We recommend sending a permission-pass email campaign to identified EEA contacts. A brief overview the broad implications of the GDPR. Information on how recipients can access, modify or delete the data you have on them (you should have a designated email established to receive these requests). HubSpot's “Subscription Confirmation Link” which when clicked, gives their consent to receiving all emails from your company (e.g. marketing information, blog subscription, quarterly newsletters, etc.). A link where recipients can update their subscription settings, meaning they can choose which subscriptions to opt-in/out of. This link has always been a requirement to send emails in HubSpot. Everyone who gives their explicit consent for future email communications by clicking on the subscription confirmation link will be able to receive automated emails through HubSpot. Unfortunately, anybody who does not provide their consent will not be able to receive emails from HubSpot - no broadcasts, no nurturing emails, nothing. Since it is so important to your HubSpot email marketing efforts to get these contacts to open and subscribe to your emails, it is important to run a permission-pass campaign that gets their attention and encourages them to subscribe. 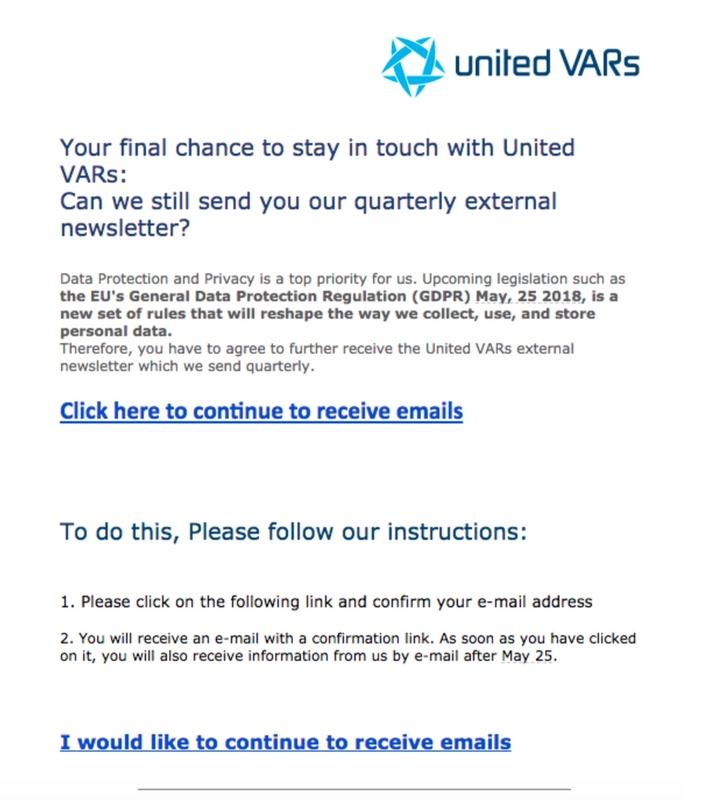 We recommend a subject line like “Your Data Privacy – Our Commitment”, or getting creative to get people to open the email. Under the new GDPR requirements, a EEA citizen has the right to access, modify, or delete the information your company has on them by what is known as an “individual rights request”. If your company is presented with one of these requests, you must comply within 30 days. Thankfully, fulfilling these data access requests with HubSpot is very easy. If an EEA citizen wants to view their information, create a list with them as the sole member, and do a full export of their property history to give them an excel sheet containing all of their information. Build HubSpot lists to clearly identify EEA contacts and non-EEA contacts. Use workflows to assign a lawful basis to existing HubSpot contacts to justify email communication. Send a permission-pass email to all EEA contacts to try and get their consent to keep emailing them. Activate HubSpot’s GDPR features, including the checkbox for “don’t email contacts without an updated lawful basis for processing”. Implement appropriate cookie tracking notifications on your website with opt-in/opt-out messaging if necessary. Implement additional form language to establish a lawful basis for communications through either explicit consent or implied legitimate interest. Overall, GDPR is an important piece of regulation that should be followed to ensure your business does not get fined or violate a visitor's data rights. If you have any questions or need help implementing the above in your HubSpot account, please contact us!